California’s enactment of a $15 minimum wage benefits millions of working people. But many continue to suffer from high housing costs and threats of eviction without cause. That’s why activists in Richmond, Alameda and Oakland are gathering signatures for initiatives on this November’s ballot to enact or expand rent control and eviction protections for tenants. Extending rent control and just cause eviction to new cities is long overdue. After California cities enacteda flurry of rent control ordinances in the late 1970’s and 1980’s, progress stopped. Tenant displacement caused by the dot-com boom of the late 1990’s led to drives for real rent control in Fremont, San Jose and other Silicon Valley cities, but the necessary laws were not adopted. Oakland ended the long drought by winning a strong just cause eviction law at the ballot at the end of the boom, but despite the steep rise in rents in recent years no other city has imposed the strong protections that tenants deserve. As I wrote last November (“The New Rent Control Wars”), protecting tenants from excessive rent increases and evictions without just cause is increasingly recognized as an essential anti-gentrification strategy. It’s also essential for addressing income inequality. Even workers getting good raises fall further behind when paying an ever-increasing percentage of their incomes for rent. Justin Timberlake Moving to Richmond? The most compelling rent control campaign for this November is in Richmond. The city’s quality of life has greatly improved under its progressive political leadership, and now the city must ensure that the working people responsible for these gains are not displaced through eviction or rent hikes. But two weeks ago I saw a news story posted on Facebook that indicated Timberlake was moving to Richmond. And those commenting on the post were not surprised. People noted that Richmond was on route to gentrification, and they assumed Timberlake would either buy a place next to retired NFL star Marshawn Lynch’s house a “7000 sq. ft. waterfront retreat”) or buy that house from Lynch. Fortunately, author and SF State Professor Peter Richardson, a former Richmond resident, commented on the post that Timberlake’s move was on a fantasy news site. But that so many believed it was possible shows that the potential gentrification of Richmond is not a mirage, and that rent controls and eviction protections are imperative. The Richmond City Council passed rent control on a 4-1 vote last July. But after landlords gathered enough signatures to force a referendum, tenant supporters decided to put a stronger measure on the high turnout November 2016 ballot. Landlords may regret the referendum strategy as the expected high turnout gives the stronger measure a great chance of passage. As with the legislative campaign, Richmond’s initiative is backed by the Richmond Progressive Alliance (RPA), SEIU Local 1021, ACCE, Tenants Together, and many other labor and community groups. Signatures for the initiative are being gathered. To get involved, contact the Fair & Affordable Richmond Coalition at 510-621-7566. Alameda is often considered the Bay Area’s most livable city. Known for its historic homes and buildings (including the ornate Alameda Theater), a city committed to the preservation of buildings now faces the challenge of preserving people—-namely, its middle and working class tenants. These tenants are now facing displacement due to unlimited rent hikes and the lack of just cause eviction laws. Last November, Alameda tenant activists won a moratorium on excessive rent hikes and no cause evictions. But the allowable rent hike was 8%, and tenants will not get this down to under 5% without a ballot initiative. Alameda’s working and middle class tenants need the legal protections that only formal rent control and just cause laws can provide. Alameda’s electorate is majority homeowner, which makes passing the initiative harder. But Alameda homeowners also have a stake in maintaining the city’s economic and cultural diversity. The current lack of rent control and eviction laws places such diversity at risk. It’s clearly a winnable fight. To get involved, contact Brad Hirn, brad.hirn@gmail.com, of the Alameda Renters Coalition. Oakland has rent and eviction protections. But its rents are rising at a higher rate than San Francisco’s, as those unable to afford the City move to the City by the Bay. Pressure on existing tenants has increased, which is why a coalition of groups is moving forward on a multi-pronged strengthening of Oakland’s existing rent control and just cause eviction laws. A key feature of the measure is reducing the maximum allowable rent increase from 10% to 5%. With so many Oakland renters now paying well over $1000 per month, this difference becomes huge. To get involved in Oakland, contact: Becki becki@cjjc.org, of Causa Justa. While three cities are moving forward on measures for November, Los Angeles is not doing the same. The Los Angeles Times wrote last weekend that the city’s rent-controlled housing is being demolished at a record pace, yet no ballot measures or legislation to prevent such demolitions is forthcoming. 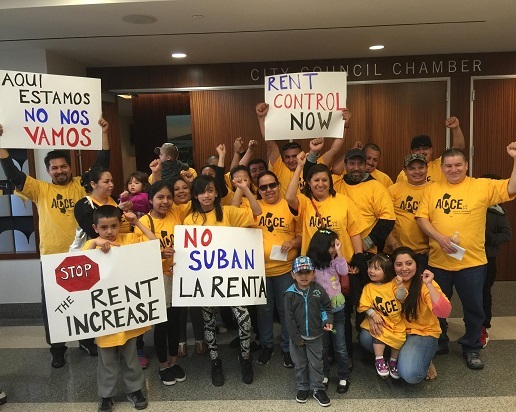 In light of its increasing Ellis evictions and tenant displacement, Los Angeles needs to act. It’s not enough for working-class tenants in Los Angeles and other cities to get a long overdue minimum wage raise; they are also entitled to being protected from being evicted without cause and from having their rent-controlled buildings destroyed. With a huge California voter turnout projected for November, tenant advocates must seize the moment to win key gains.